﻿﻿When my oldest granddaughter was two years old, Santa brought her a wood rocking horse. She was so cute riding her horse with a play cell phone at her ear. She rocked and talked for hours! 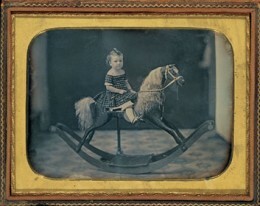 Rocking horses are just as much fun for kids today as they were for kids of past generations. I remember playing on these wooden steeds when I was a small child and the fun they were. My kids loved riding them, too. While children have ridden stick horses for hundreds, maybe even thousands of years, the rocking horse is believed to have been developed during the 17th century following the invention of the bow rocker. 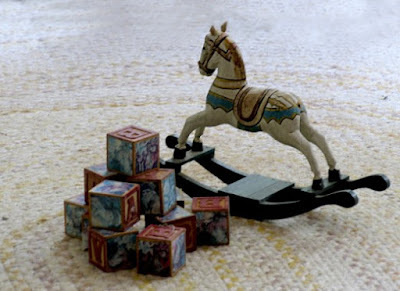 There are some earlier mentions of rocking horses in medieval manuscripts, but most scholars believe those to have been small toys, like the one in the photo below. If you are the crafty type, you can build your own. There are a variety of rocking horse plans available. At one time, only the most affluent families had hand-carved rocking horses for their children. These days, almost anyone can have a mass produced wooden horse for their kids, but hand-carved riding toys are still expensive. Building a rocking horse for your special little one creates a beautiful memory for both you and the child. A hand made wooden toy, if cared for, can become an heirloom that rocks through generations of small children. If you decide to build your own rocking horse, make sure that you use quality materials. Oak or teak are good choices. Pine, though much cheaper, is likely to split after several years, which may make the toy unusable and unsafe.